Flopzilla is a poker calculator that has been designed to let you quickly and easily figure out how a range hits a board. Just enter a preflop range and a board and Flopzilla will work out for you how often that range hits hands like top pair, middle pair, a flushdraw, a gutshot, etc. The interface is designed to be quick, easy to use and intuitive. Flopzilla will improve your pre-flop game, allowing you to make more correct decisions and more profitable play. Whether you're playing multiple games of zoom at once or a big field MTT, Flopzilla will enhance your game. It's hard to understand just how much this one tool can enhance your game until you've tried it. 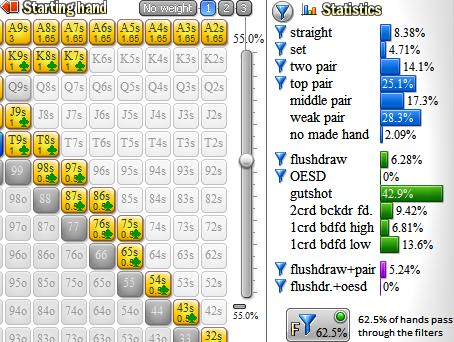 Flopzilla is a poker calculator created to make range reading and analysis a breeze. It's as easy as entering a pre-flop range.